Why should you train your kids in sports when they are young? Do kids need a mouthpiece to play sports? How to mold a mouthpiece? It is an undeniable fact that the kids’ health should be the top priority. As the rate of obesity is rising, everyone talks about the importance of exercise and sport for children and adults as well. This is because active children tend to become active adults in the future. Whether an individual or team-based sports, it is a great activity for children which deliver not only physical but also mental health. Sports participation helps to build children’s confidence, self-esteem and also motivates them to excel in academic as well as promote social skill building. Kids often fear of competition particularly in losing. Their fear makes the competition even scarier than it supposed to be. But when they actually involved in sports or games, they will realize that competition is not scared at all. This also helps them to take risks once they figure out that competition is not a scary thing. Sports also teach them to cope when things do not go the way it supposed to be such as when losing a competition. Physical activity – the most obvious advantage of sports for young children is physical activity. Children these days spend too much time playing video games or watching television. We all know that not getting enough exercise can lead to obesity and other health issues. But practice sports and games provide an opportunity for children to keep active and also help them in shape and healthy. Self-esteem – besides physical advantage, kids who participate in sports are likely to get a huge positive impact on their confidence and self-esteem. Participating in sports makes children receive encouragement and also praise from parents and coach. This helps build their self-confidence. Through this way, they also learn to trust their abilities. Besides building self-esteem, sports also teach children about constructive criticism. Children will learn to accept criticism and use it to perform better. Social skill – participate in sports helps children develop important social skills that they need throughout their lives. Not only they learn to interact with other kids at their age, they also interact with the sports officials and also coaches. They learn how to work in a team and not being possessive with their belongings. Most importantly, children will also learn to win and lose with dignity as part of the games. These skills are beneficial will be a great help for them in school, future career, and also a personal relationship. Lifelong health – Sports do not only promote overall wellness and health during the childhood but also throughout their lifetime. Some sports such as golf and swimming can be beneficial since they can continue playing the sport as part of their physical activity. In addition, participating in sports may also make children become more aware of healthy food choices and most likely stay away from drugs, alcohol, and such thing. Even though sports can be a great method to introduce healthy lifestyle for children, but it is also important for coaches and parents to encourage healthy lifestyle as a positive role model for them. Academic success – no surprise if participating in sports help children excel in their study. This is because they apply the same dedication principles and also hard work that they learned during sports participation. According to study, young women who participate in sports during high school are likely to have chances of graduation by 41 percent from college. As much as people talk about the importance of sports at a young age, children are actually not supposed to specialize in one sport only at a young age. Some children may start competing at a young age in acrobatic or artistic sports such as diving, figure skating, and gymnastics. But still, they are encouraged to play other sports as well. Trying lots of different sports and activity is the best method to help prevent injuries and burnout. It also teaches them to learn many different movements. Sure, there may be a time when your children say that they really like certain sports. But in their early age, it is encouraged to help children getting active starts. Many parents mostly wonder when is the ideal time to encourage the children to start focusing on one sport only. At the age of 4 to 6, children should learn to be active. They can try numerous different activities before actually choosing one by the age of 11 to 15 for girls and 12 to 16 for boys. However, parents should remember that these are only numbers. The most important thing when choosing specialization sport is physical and mental maturity. Children may enter that maturity stage even before hitting the aforementioned age. If your children decide to enter this stage earlier, they will have to learn how to train, rest, compete, and other sports-related skills, movements, and tactics. Specialization is great and it can be beneficial, but it should be performed only when the children are ready. Once they choose one sport, parents should provide the right support including certified coach and proper equipment. Being active can be a lifelong positive habit that should be implemented from a young age. But when it comes to kids’ choice of sports specialization, let it becomes their personal interest. Most people may think that mouth guard can only be used for children who play basketball, football, soccer, boxing, ice hockey, field hockey, and lacrosse. The fact is kids who play the non-contact sports such as mountain biking, skateboarding, and gymnastics should also wear a mouth guard for their safety. Mouth guards for children are not a choice. It is regarded as another piece of basic equipment and uniform. More importantly, it should be worn from young age and so it becomes a habit and routine-formed. Even though kids mouth guards do not reduce the risk of getting injuries during sports, but at least it limits the severity of mouth-related injuries. So, what is actually a mouth guard? Youth mouth guards are flexible and strong appliances which are specifically designed to protect the mouth from injuries and trauma. The mouth guard covers the gum and teeth as well as prevents and reduces the teeth and areas on the mouth from injuries. Without wearing proper mouth guards during sports can result in numerous kind of serious mouth injuries such as chipped to loss teeth and also never damage. Recent studies also found out that wearing mouth guards help prevent neck injuries and concussions which becomes a serious concern for parents. Most parents understand that mouth guard should be worn for children who play boxing, football, and hockey. But football mouth guards are also recommended to be worn for other sports as well including handball, gymnastics, basketball, acrobatics, skateboarding, volleyball, water polo, surfing, wrestling, and much more. Wearing mouth guard is mandatory for both amateur and professional athletes. Unfortunately, not many people realize the importance of mouth guards simply because it does not fit well and comfortable. Also, wearing mouth guard makes not cool looking as well as complaints about impaired speaking. In some extent, gender bias also plays a role for a not wearing proper mouth guards. There are people who mistakenly think that female athletes are less at risk of injuries and less aggressive, and thus, they do not actually need a mouth guard. The fact is both male and female are exposed to the risk of injuries once they do sports. Therefore, a proper mouth guard is important to provide protection to mouth-related injuries. Even though most parents are aware of the importance of mouth guards, but there is still question whether should my children wear a sports mouthguard or not. Whatever the sports that your children engage, it is important to reinforce them to wear mouth guard along with other protective property such as helmets and knee and elbow pad. Stock mouth guard – this kind of mouth guard is the least preferred. This is a store-bought mouth guard for sale in department stores, sports goods, and also drug stores. The stock mouth guard comes in pre-formed and it is ready to wear. This device is the least expensive of all types of mouth guards but it is also the least effective for protecting the mouth. When it comes to comfort, this stock mouth guard is also available in limited size. Some athletes end up modified this mouth guard for a better fit. Boil and bite mouth guard or the mouth-formed guard is the commonly used mouth guards. This mouth guard is made of thermoplastic in which when immersed in boiling water turns into a fit and formed guard in the mouth. 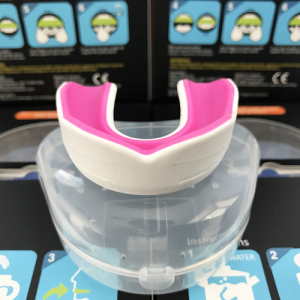 The boil and bite mouth guard is available in drug stores, sports goods, and also online. The custom-fitted mouth guard – this type of mouth guard is the more expensive than other kinds of mouth guards. Not only the price is expensive, the custom fitted mouth guard provides the greatest level of comfort, fit, and also protection. This is because the mouth guard is made precisely fit the mouth and teeth contour. Among all those types of mouth guards, we recommend the boil and bite mouth guard to provide protection during sports. As the average level of the mouth guard, it provides protection and easy use. Before wearing the mouth guard, it is important to boil the device in hot water and then your kid should place it in the mouth and bite down. The device will be formed according to child’s mouth because of the bite pressure and also the help of your finger to form make it feet to the teeth. As part of the important piece of equipment for sports, it is important to properly mold the mouth guard, so it fits properly in the kid’s mouth. For the best protection, a properly fitted mouth guards are crucial because ill-fitted and uncomfortable mouth guard is less likely to provide the best protection. Below are some simple steps on how mold mouthpieces that you can follow. Before starting, the process, gather all the equipment including the mouth guard, boiling water, tongs, towel, and ice water if needed. Also, make sure that you have read the fitting instructions for the correct way to mold mouthpiece. After that, boil water in small pan. Make sure that the water is enough to submerge the mouth guard. Then, boil the mouth guard in boiling water for around 20 to 30 seconds. The mouth guard should be heated to the level that you able to mold it and not the point where it begins to melt. After 20 to 30 seconds, remove it from boiling water using tongs since you do not want to mess with the mouth guard shape by tightly squeezing it. Cool down the mouth guard in cold water or air dry; choose one according to the instruction. Then place the mouth guard in the mouth and push it against the teeth using finger and bite it down. Pull the mouth guard to the teeth by pressing the tongue against the roof of the mouth. After it is formed, you need to cool down the mouth guard once it is fitted to the mouth. When the mouth guard does not fit properly to the kid’s mouth, you can just remold and start the process all over again. The boil and bite mouth guard is the easiest way to make sure that the device fits properly to the mouth.